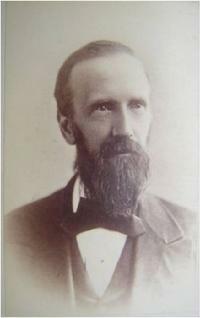 James Reed Clark was born in Pennsylvania in October 1843 to father Matthew Henderson and mother Anne Alison (Reed) Clark. His parents had been married on October 19, 1842, but Anne died when James was only 5 years old. His father married on Rebecca Marshall in 1850. The union added several more children to the household including David (b. 1860) and sisters Margaret M. (b. 1853), Anne Alison (b. 1857) and Janet (b. 1862). His father was a physician and could afford to employ one or two servants to assist with the household tasks. James attended Washington and Jefferson College in his hometown and was trained as a pharmacist. He opened a drug store in Washington, Pennsylvania and eventually accepted his younger brother David into the business. James married Laura Barlow Reed (b. March 1846) in 1868 and they settled in Washington the same neighborhood as his parents. The Reed's were also a very prominent family in western Pennsylvania. His wife was a distant relative of his mother. But in 1883, James and Laura moved their family to Mandan shortly after the completion of the railroad line to the West Coast. James established his business initially at the corner of Fourth Ave NW and Main Street. However Clark Drug Store was moved in 1885 into a new building finished Lyman Cary, his future son-in-law. James and Laura had brought their three children, Colin Reed age 13, Anne Alison age 11 and Isabel J. age 9 with them. A young German girl Martha Jahuke also lived with the family as a domestic servant. 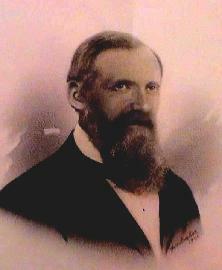 Laura's father Alexander Reed was described as a "close and studious reader" and "a man of public spirit" who served for years on the board of curators for their town's Citizens Library. Apparently his daughter and son-in-law both understood the importance of a public library. The store was quickly the repository of books for a public lending library and remained there until the stock of books outgrew the space in 1903. The operation was the forerunner of Mandan's present Public Library. James also served his community in a variety of civic positions. He served on the Federal grand jury in Devils Lake in 1893. He also served on the Board of Trustees for the ND State Reform School in Mandan from 1896-1897. Mr. Clark was an early Elder in the First Presbyterian Church in Mandan and was very generous to his church. He was elected as alternate principal lay commissioner for the North Dakota Presbytery in 1901. 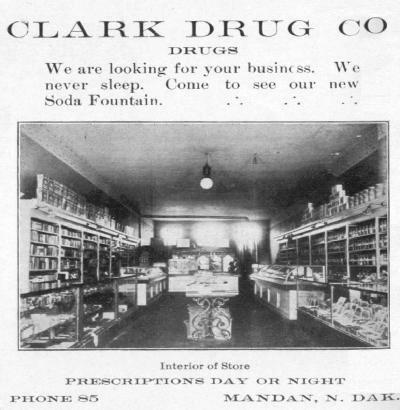 James and his wife Laura remained in Mandan until 1906 when he retired at the age of 63 and sold his business to Olaf Lindelow who would rename the business "Mandan Drug". Clark, his wife and youngest daughter Isabel returned to Washington, Pennsylvania and took up residence on South College Street. Both James and Laura would remain there for the remainder of their lives. Colin became a physician and received recognition for distinguished service in WWI. He moved to Ohio where he got married and raised his family. Isabel taught school in Mandan and later in Pennsylvania. Anne Alison married Lyman Cary in 1894 and remained a Mandan resident until her death in 1969. The Society appreciates the assistance from James Clark's great great granddaughter Lori Bettcher for providing genealogical information for Matthew, Anne Alison and Nancy Clark.